“Glenn Goode currently serves as a Hazardous Materials Specialist with Iowa Motor Vehicle Enforcement, where he has been employed since 2002. A brief summary of his duties include inspecting commercial motor vehicles to determine compliance with the Federal Hazardous Materials Regulations adopted by the Code of Iowa, issuing citations and making arrests for violations of the Code of Iowa, and responding to motor vehicle collisions that involve vehicles transporting hazardous materials. In addition to his enforcement duties, Glenn teaches Hazardous Materials Awareness at the Iowa Law Enforcement Academy, is a national General Hazardous Materials and Cargo Tank Inspection Instructor, and is a Doppler RADAR/LIDAR instructor. 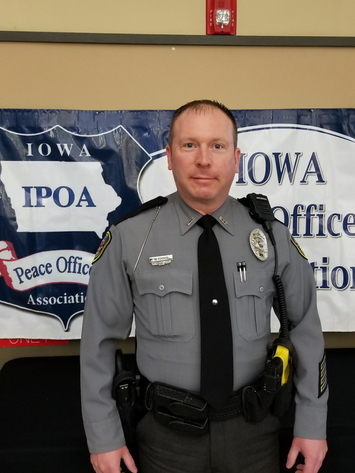 His law enforcement career began with the Estherville Police Department in 1997, where he worked as a reserve peace officer while attending Iowa Lakes Community College. After graduating with an associate of science degree in criminal justice, he was hired by the Scranton Police Department, where he served as a police officer until he was hired by Iowa Motor Vehicle Enforcement. Over the course of his twenty-one year career, Glenn has also worked part-time for the Greene County Sheriff's Office, the Anita Police Department, the Madrid Police Department, and the State Center Police Department (where he's currently employed as a part-time police officer).